This vibrant blue dress form is perfect for precision sewing or a display piece! Get the same results as a professional garment maker in your own home! The dress form's 13 Dial & Key Adjustments provide a perfect fit. The Foam-Backed Fabric Exterior allows you to easily pin dresses, skirts, tops and patterns. The easy tool-free Height Adjustment lets you customize the dress form to your height in a snap. 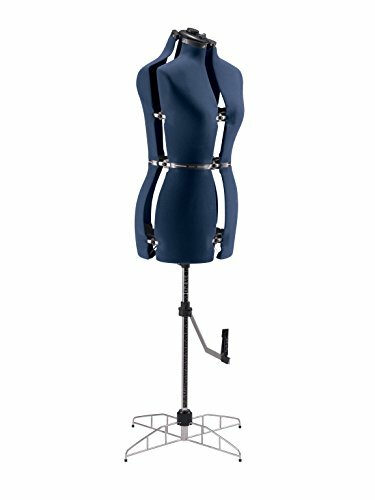 Four-Leg Metal Base provides extra durability and added stability for those heavy dresses and costumes. The Pin Cushion with Key Holder located at the top of the dress form provides convenient storage for pins and adjustment key. The 360 degree Hem Guide allows you to pin or mark garments for even hems and alterations. The included 1-year Limited Warranty gives you peace of mind.